UNGIWG concluded with another half day of openness. In the morning we heard about the geo activities of our hosts in Vienna .. UN Office of Outer Space Affairs, Comprehensive Nuclear Test Ban Treaty Organization, International Atomic Energy Agency, UN Office on Drugs and Crime. The CTBTO presentation was especially fascinating. They conduct one of the most important jobs at the UN, and for monitoring nuclear tests have deployed and leveraged several global sensor networks. The seismic fingerprint of nuclear tests are distinct from earthquakes. Noble gas isotopes are clear signs of a test. Infrasound and hydroacoustic measurements are also deployed; a nuclear test should register on all the sensor networks. The details on locations and functioning of the sensor networks are clearly communicated to the public in this elegant map. The information infrastructure to receive and process this flood of data streams is formidable, with 5 dedicated satellites and extremely minimal distribution lag to all the signatory countries, and analysis and permanent archiving in the Vienna center. The requirements are stringent , the solution robust and well funded. Of interest to the wider sphere, the archives are made accessible for unrelated activities, like tsunami early warning, volcanic blast detection, and climate change monitoring, all a wise example of reuse and repurpsoing of data. It’s not completely *open* but demonstrates how data access results in unexpected uses. Lightning talks filled the rest of the monring. I gave two, and almost three. An introduction to GeoCommons led nicely from the previous days discussion of neogeo vs sdi. I gave a brief overview of the system and philosophy, with a brief example derived from Sean’s demos for the Gates Foundation. Good to see the acknowledgment that GC is bringing the accessibility of web tools with the analysis and cartographic care of traditional GIS. I took slight advantage of my 2nd lightning talk on OSM, adequately covered the day before, to switch and give a brief demo of Crabgrass and the work I’m doing at the UNDP. UNGIWG meets infrequently in formal meetings, and there’s scope for more sustained, agile, deeper contacts. There are an estimated 500-1000 GIS professionals in the UN system, and most are unaware of the work of UNGIWG, with extremely demanding work schedules and little opportunity to draw lessons from the wider community. My feeling is that a social network infrastructure is ideal to facilitate SDI, the human context is crucial when developing machine readable interfaces, and especially if that platform is open source and being deployed already in UN agencies. We’re currently working to set up an UNGIWG crabgrass, one of the brightest outcomes of the event for me. Open source still faces difficulties in the UN. It’s commonly acknowledged that open source solutions, especially for geodata and maps on the web, are superior than proprietary offerings, but the commonly heard refrain is that the IT management is hostile to deploying open source. The expectations and accounting for software is biased against OS solutions, a grave irony when OS supports the objectives of the UN itself. Open source can provide valuable resources to beneficiaries just as a byproduct of UN requirements, and gives a technical basis for cooperation between UN agencies .. but this doesn’t happen that often. The must change, by appeal to upper management, something I hope is addressed at web4dev in February. There are bright spots of course. CampToCamp have developed camp management web platforms for UNHCR with open source tools, which I hope will provide opportunities for cooperation with efforts like Sahana (which has gotten some support from the UNDP), Ushahidi, and other crisis mappers, and the emerging OSM Corp concept. Outside of UNGIWG, Vienna was lovely as ever and treated us well. The overflowing Baroque of Vienna is uplifting, the old masters and vaults of science, churches bubbling with iconography, even to the modern modern museums quartier, baroque is the guiding fabric (and home to a great cafe). The urbanity of Vienna is inspiring, imperial layered landscapes, imaginative restorations of the gasometer, enduring socialist idealism of Karl Marx Hof, speeding BMWs down cobbled luxury streets, walkable, cyclable, the best transport system anywhere. If only the city stayed open later. Even the brutal, only good on paper Vienna International Centre carries 60s UN hopefulness, and a reminder to remember the human scale even when buildings do not. That all was the scene for good times and some misadventure with old compagni and new of our geo vanguard. And with a final sweetness, just dumb luck gave me the opportunity to facilitate a rather large geodata domation to OSM, more on that as things finalize. UNGIWG, meat on the bones. OpenStreetMap and the UNSDI. There is very much an emerging just $*! (% do it attitude. SDI East Africa has gone ahead within a specific geography and user base, started setting up the infrastructure of GeoNetwork and GeoServer and just put it into action; there are wins and there are glaring examples of why SDI is needed. Andrew Turner and I had the pleasure of meeting many of these folks in Nairobi, including a session with the Somalia Interagency Mapping and Coordination group (their walls were plastered with real pirate maps). Elsewhere in the UN, UNOSAT and GeoNetwork have supported GeoRSS for a while now .. using the simplest thing that works and not reinventing the wheel. There’s many encouraging signs. The remarkable thing about the opening panel at UNGIWG 9, “SDI vs. Neogeography” was how everyone dropped the versus. Everyone in the room uses the web, uses google maps, facebook, posts cat photos. They get that web and bottom up standards work for easy interoperability, get the user focus, and some “excessive creativity” like maps of UFO sightings is a good thing. And the neogeographers also get that formal SDI and GIS have requirements of precision, complexity, and cartographic elegance that aren’t always met. So the two approaches are moving to adapt and hybridize and meet halfway. For forward thinkers in either camp, there isn’t an antagonism here, only an opportunity to improve things for everyone. Earlier this year, Chris Holmes gave a great presentation on this theme, the GeoWeb and SDI. Nicolas Chevant and I presented the vision going forward for the UNSDI-t and how our work with OpenStreetMap supports that effort with real tangible results today. Nicolas has developed a widely accepted schema for the transport layer of the UNSDI, no small task when every agency had a different method of recording road data. The neat thing is that this top down process generated schema closely resembles the key/value tags in OpenStreetMap. Perhaps not so suprising since we’re talking about the same underlying reality, but instructive that two very different processes can get similar results .. the informal, bottom up crowd does work. And OSM can learn from the formal schema. In the UNSDI-t, the emphasis is on the practical passability of roads, rather than official classification. That’s important in many places that the UN operates, and in many active OSM communities. With OSM’s open tagging system, it’s easy to build equivalencies to other schemas and retain the original attiributes as well. So OSM has been able to bring in UN road data, and other thematic layers should pose no problem. OSM has imported many data sets (AND, TIGER, GeoBase soon..), as well as UN data sets. Neil Penman, Brett Henderson, and Ian Checkley of IBM volunteered to start with the UNJLC data for Sudan, built shapefile imports, and tag equivalencies. Issues of data quality and provenance reared early, in an emergency, you scramble to grab any available data source you can find, copyright or not, but that won’t fly for OSM. The larger looming issue is data synchronization. OSM is a single node in a wide UNSDI, and the question is how do these multiple updating databases provide the opportunity for choice of best dataset and synchronization. It’s a huge issue generally for the GeoWeb, and OSM API v0.6 provides a little bit of the scaffolding OSM will need to accomodate multi-master sync. Overall Sudan proved the OSM and UN were entirely compatible mapping partners and set the stage for more. After Cyclone Nargis, I met Christopher Tun at WhereCamp, and quickly got working to provide support for web mapping infrastructure in the relief effort. Unlike most every other disaster, the UN was not free to operate on the ground in Myanmar. They UNJLC did what they could with existing data and satellite imagery, and in a crucial change, the maps themselves started asking for contribution. Fortunately through Chris, we were connected to local engineers who could operate the server and survey the disaster zone. The team from IBM joined in again, and started working directly with Sahana, to deploy on a single server inside Myanmar, where it would be more accessible to locals. We set up a full OSM server and mapnik tile server running locally inside Myanmar, along with osmosis to help facilitate diffs and synchronization. Sahana integrated their excellent excellent GIS module fully with OpenStreetMap. We had great remote training sessions with the Myanmar team, in Bangkok, via the surprisingly useful webex, and there were plans for us to visit directly. However things have gone quiet since the flury of activity, and I only hope it was of some enduring use in the relief effort. In any case, there was good technical development and increased capacity on the tech support side of things. Our last interaction was the response to Hurricane Hannah in Haiti. This time we partnered with CartONG, and specifically focused on getting a routing service set up with OpenRouteService. Chippy provided great assistance with Shapefile wrangling and presence in Geneva for follow up meetings. The OpenRouteService experimented with a simple OpenLayers interface for users to roughly mark blocked roads, and adjust the routing based on this quick feedback. The only downside was that our best data source was provided in a not entirely open form. We couldn’t import it directly in OSM, only into a special instance of ORS, and so we don’t have something of last use .. open data is always where we want to be. Myself and others on the openstreetmap foundation board, and in the large global volunteer community, are keenly interested in the activities of UNGIWG and the development of the UNSDI. Data sharing among agencies, governments, and ngos for humanitarian purposes is totally complementary to the OSM mission, to create a free and open of the entire world. I whole heartedly offer our support and willingness to work with you all as an engaged and practical partner to build nodes in an SDI that works for the world. Author mikelPosted on November 17, 2008 Categories opengeodata, openstreetmap, UN1 Comment on UNGIWG, meat on the bones. OpenStreetMap and the UNSDI. Last week I was in Vienna for the 9th plenary meeting of UNGIWG, the “United Nations Geographic Information Working Group”. That meant muted but real celebration of Obama’s victory in UN chambers. Good stuff. UNGIWG is a group of UN professionals working together to solve problems and cooperate on all manner of things concerning maps and geographic data, most especially for humanitarian purposes. The UN publishes a huge number of maps, just check out ReliefWeb for a start; they utilize maps internally in the Security Council and Peace Keeping operations, just for a start; and have un-enumerated databases of geodata, of which Geonetwork is the tip of the iceberg. There’s a vast untapped potential for geodata and map sharing at the United Nations, to help the agencies themselves work individually and together in a better way, and to serve UN beneficiaries .. aka The World. That data is often locked up or slightly inaccessible or in weird formats, etc. The aim is to produce a “Spatial Data Infrastructure”, perhaps defined as “the technology, policies, standards, human resources, and related activities necessary to acquire, process, distribute, use, maintain, and preserve spatial data”. To me that sounds like the same issues facing the Web at large, and IMO the Web is doing a pretty decent job at sharing. So with my long term interest and work with software in the UN, and insights into the whole GeoWeb thing, I was invited to participate, along with fellow “geographic hooligans” Schuyler Erle, Danille Nascimento, Sandra Sudhoff and Yann Rebois from CartONG, and of course my collaborator within the UNSDI over the last year, Nicolas Chevant. I personally ended up juggling three different hats, as OpenStreetMap Foundation Board Member, representative of FortiusOne (inherited through Mapufacture’s previous engagements in UNSDI), and finally UNDP, as consultant on WaterWiki and the UNDP Crabgrass install. The final hat gave me a seat at the big table and closed sessions, open only to members within the fascinating and overwhelming alphabet soup of the UN System. The UN is in essence a diplomatic forum, and the corresponding ethos trickles down into the everyday workings inside the UN. UN meeting rooms have comfortable chairs and an equal playing field, and the organization of UNGIWG has produced an abundance of the necessary procedural documentation to get the officials of 30+ agencies working together and willing (potentially) to fund projects and send representatives and basically make the space for things to happen. Diplomatic procedures also produce long timelines .. we heard dates such as 2020 mentioned a few times. I’m all for the long now, but we all think that something can be done in a more web scale timeframe. The common refrain was that “the technological problems are nearly solved, it’s the social process that’s in question”. This also extends to dealing with IT. While a majority of the attendees were technologists, they aren’t the ones in charge of deploying technology, and there are formidable barriers within the UN to doing something creative, especially with open source. IT sometimes treats its job more like a utility than a creative endeavor, and that’s a very limited view. I hope to raise this at the UN Web4Dev conference in February. So that’s the stage, some idea of the issues and perhaps why our perspectives were invited into the show. More on what went down tomorrow. How do *we* determine the names for things? Illuminating and fascinating reading on Google’s naming policy for disputed places. Commendable that their decision making process, and the process for devising that process, have been so transparently communicated. There are things here for any mapping organization to learn from. And interesting to see how far Google’s process has paralleled OpenStreetMap, and where it ultimately diverges .. in the basis for authority. I’ve had an interest in the nature of borders and conflicts in mapping ever since maps started to take over my life ;). Traditional cartography hadn’t done a very good job of representing the multiple, fluid realities of the world, especially in the age of nation states. The reality of borders isn’t represented very well by a thick black line. For instance, the national boundaries within the EU are tending towards something like US state borders; in fact, crossing into California, through the agricultural checkpoints, is more restrictive than driving from Germany to Austria. Better are the maps indicating the shifting line of control of WW2, so fascinating to me in my childhood atlas. The thick black line gives the illusion of stasis and control, but ultimately it’s all temporary. Like most ultimately liberating technologies, maps were primarily designed as military technology, to claim territory, demonstrate authority, control reality. The promise of digital democratic mapping up-ends the military origins. Digital maps have the potential to express multiple and opposing points of view. OpenStreetMap had the start of its first edit war in the fall. It won’t be the last. At issue was the territory of North Cyprus, in conflict since a nearly universally regarded illegal (excepting Turkey) invasion by Turkish forces over 30 years ago. A English expatriate living in North Cyprus was labelling places with Turkish names. A Greek Cypriot, whose father fled from North Cyprus, had been switching to the Greek names. And back and forth. Traditionally places had both Greek and Turkish names, and Greek and Turkish people, and people used whatever localisation they choose. With the political/military conflict, and a global platform for communication, the conflict has spread to open databases. The Wikipedia article on Cyprus is often in conflict, and now OSM. I attempted to intervene and broker a solution between the fighting editors. Perhaps I had been spending too much time at the UN, and fancied myself a digital diplomat. With much patience, we came to agree that both Greek and Turkish names will be represented, in A/B fashion. But in the end, we could not reach consensus on who was A and who was B. So disappointedly, dialogue in this case failed. The discussion within OSM for a solution has been wide ranging .. everything from totally laissez faire, i.e. letting the editors fight it out until one gets tired, policies for disabling certain user accounts (ineffective), whitelists, blacklists, to locking down certain areas from any editing at all. As with most “decisions” in OSM, the solution has been a combination of the simplest thing that works and whatever someone takes the initiative to actually code. We have a rule but no code changes (though disputes has led some impetus to implementing changesets and reverts). We have called our rule the On the Ground Rule, which resembles greatly Google’s Primary Local Usage. The difference of course is in where the ultimate authority for applying this rule lies. Preceeding this difference, I think I can detect something of the frustration I’ve experienced in attempting to free data from the United Nations as Google has. “We considered attempting to extricate Google entirely from the problem of deciding placenames by simply deferring to the determinations of an existing, authoritative, multilateral or multistakeholder institution.” But the UN keeps a strict policy that their maps are not official political representations, and takes no authoritative stance on boundaries or names. Frustrating, since essentially the UN is hamstrung by the traditional, single reality view of cartography. So, Google has imbued itself with the authority for these decisions. And they have the funds to employ a Director of Global Public Policy to think these thing fully through. Of course, of any authority, they are presently most open and transparent. Google is spreading its remit way beyond organizing the world’s information, to organizing the world. They are investing in green energy technologies, sponsoring humanitarian information software development, advising governments and intelligence agencies on how to operate. And perhaps the primary colored, happy, relatively open and efficient world of Google is a better alternative to the current world order! They’ve done such a good job with the web, give them our world. Google has become a target for such sarcasm on many fronts .. because it wasn’t supposed to be this way. The interweb would rebalance power and authority, and this potential is what inspires me for democratic digital mapping. In this vein, Google is an systematic aberration, amassing power by doing what it should — being good. But does power inevitably corrupt? That’s the fear, and the remorse that it doesn’t necessarily need to be this way. the tagging process touched on this very issue. Jokingly, OpenStreetMap was described as an anarchic collective, but I don’t think that’s far off. There is some ultimate authority — the Foundation runs the servers — but only in the most hands off caretaker position. Beyond some extremes, it’s a continual negotiation and consensus building process, never definitively settling, open to newcomers and new perspectives. The authority of OpenStreetMap is its Openness. This difference in authority has real implications for real maps. Here is Google and OpenStreetMap compared for Cyprus. Google has decided to dodge the issue completely by not providing any data for Cyprus. There is definitely data commercially available, since Microsoft maps do show boundaries, roads, and names. OpenStreetMap shows the still somewhat messy circumstances. OSM has better potential solutions. Our database is already internationalized. All that’s waiting is i18n and localisation of the maps themselves. In an interesting twist, this is one of OSM’s proposed Google Summer of Code projects. Another twist is that the student proposer is from India, and the problem of localising Indic scripts is a complicated one — how a series of characters is rendered differs based on their order, so rulesets/state machines need to be embedded in fonts. Yahoo India has made some impressive progress here, rendering Indian placenames in the local script of each Indian state. The Indian state itself provides the forum for sorting out placenames — state divisions are organized, and reorganized, along real and sometimes semi-imagined linguistic lines. But of any place I’ve ever visited, India demonstrates the greatest variety of people living in relative harmony .. so if there’s any place that will work out the solution for the promise of multiple points of view in digital democracy, I reckon it’s India. Author mikelPosted on April 16, 2008 July 19, 2010 Categories borders, india, openstreetmap, UN4 Comments on How do *we* determine the names for things? There are probably too many projects I have an interest in but too little time for. On these I generally cheer lead when needed and make connections to other people and efforts, and give little nudges occasionally so that they’re rolling in the right direction. Chris Schmidt has built a working version of the OpenAerialMap concept. Excellent. We’re moving from talking to hacking, and this seems poised to grow rapidly. I’m going to add imagery from Merano when I have the chance. Web4Dev wrapped up last week, and Anna & I are back from NYC. It was a great experience .. the presentation went really well, we met many people at the UN and with NGOs/etc, and got a good insight into the United Nations system. Wednesday morning, I gave my presentation of Wikis at the UN, the projects Anna and I worked on at the UNDP and INSTRAW, in the session on Collaborative Tools with Sarah Kerr. 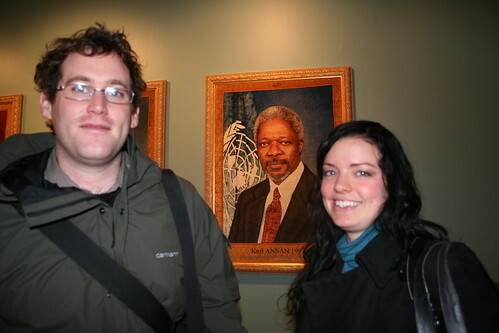 I was really excited to speak on this and advocate more wikis at the UN. The presentation was received well, and we met many people interested in wiki projects. It was even suggested to use a wiki to organize next year’s conference. The web4dev wiki we set up demo’d great, and I we had a bunch of attendees add details. The entire event was webcast, and immediately archived; great job by the UN AV guys. Here’s the video of my presentation. You can download the slides from here watch out, this is 22MB!. And there’s the transcript of what I said. The Web4Dev conference proper was insightful, to understand how web development operates within the UN. However the impact on Monday, the Global Alliance-AIT sessions, was not positive. The AIT Global Partnership is a series of events to strengthen the UN’s use of technology through cooperation with IT corporations and professionals. Their sessions came off as a brazen sales pitch; during a panel on SOA (just web services and widgets, jargon for CX0), an audience member asked “What does this have to do with development?” and it appeared that the panelists didn’t even understand what “Development” meant in this context. Now I definitely agree that public-private partnership is crucial to successful Development ICT. Sometimes the market responds in unexpected ways; for instance, Intel is apparently considering developing a competitor to the $100 Laptop. But Monday showed the dangers of such initiatives being hijacked by the private portion. AMD’s 50×15 project to have internet access to 50% of the world by 2015 is great, but will their educational initiatives be pushing open source software development in classrooms? Several times I heard the phrase “Open Source is not free”, referring to maintenance and other costs, which of course if true, but it was being used as a dismissal of open source as a viable option. I think it’s more than a viable option .. it’s absolutely central to ICT in the developing world, not only because of the cost savings, but the freedom to modify and educational opportunities. Socially, open source software leads to open knowledge and open democracy, which I am pushing for with wikis. The UN itself works at cross purposes on this, with many open source initiatives, while at the same time licensing more and more from Microsoft internally. The UN itself could do so much to raise the profile of Open Source internationally. I raised these issues during the final feedback session, and others in the audience encouragingly concurred. Overall there was a wonder on Web4Dev was all about, and a real desire to find that .. how can we continue to work together, finding leverage points with the UN system, working effectively, “UN 2.0”. Another surprise was the call to build large and not “just release”. The school of thought to architect completely before building is alive and well .. while rapid prototyping and iterative development is accepted practice everywhere else on the web. Or at least a “lightweight” approach. One UN project which really impressed me was the UN Online Volunteering Service. They “connect development organizations and volunteers over the Internet and supports their effective online collaboration”. If you want to volunteer, you search for postings from organizations, get in touch, and get to work .. all online. They eat their own dog food .. a large part of the site redesign and translations are done by the same volunteers. The actual staff is only 3 people. Sounds like a Web 2.0 startup! 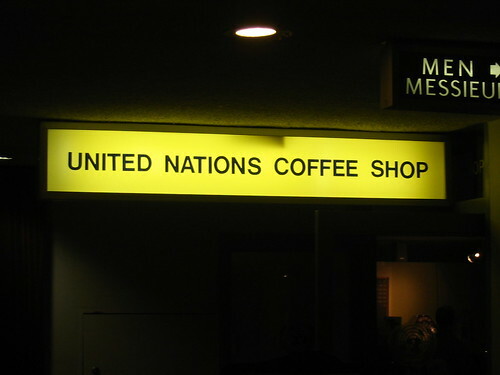 Being inside the UN was great. The international style still feels so optimistic, formal and relaxed at the same time. Not too anachronistic, though the cafe outside the meeting rooms is probably the last place in NYC that allows smoking inside a public building (diplomatic immunity and all). Wonder if that will survive through the upcoming renovation. After the conference closed, we had lunch at the Delegates Dining Room, great food and a ridiculous amount of fresh berries on the desert table.